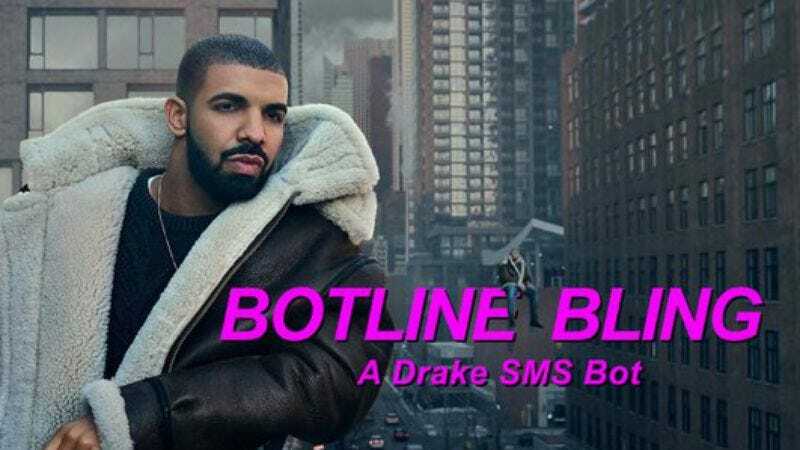 Medium Slackjaw editor and Onion Labs copywriter Hassan S. Ali has updated the world of mobile telephony with Botline Bling, a new Product Hunt submission that simulates a text-message relationship with Drake. It puts Drake’s wit, wisdom, and invitations to meet up at a Tim Hortons right there on your cell phone screen. It’s enough to fulfill the Drake-sized hole in your texting heart. So if you’ve ever wanted to know what Drake would do in a particular situation, or are just really bored and want to waste hours on your phone, get started by texting “Botline” to 630-755-6641. Then just sit back and let Drake’s genius wash over you.